I love salmon, I could eat salmon everyday if I could afford it. I buy wild-caught Alaskan salmon and it is fantastic. This is probably my favorite way to serve salmon, simple and elegant. I believe a fish like salmon doesn't need much to elevate it. 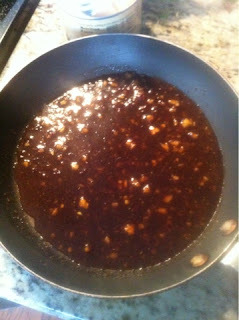 Mix marinade up and spoon out several tablespoons to reserve. 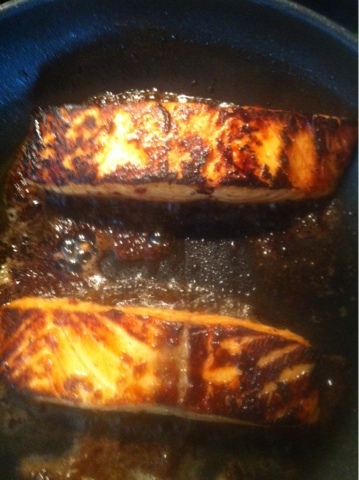 Place fillets in marinade and let rest for 10-30 minutes, turning occasionally. Heat open-proof skillet with 1 tablespoon butter, 1 tablespoon olive oil until shimmery. 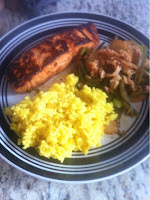 Place salmon presentation (pretty) side down in pan. Sear for 4 minutes. See how beautiful they are? 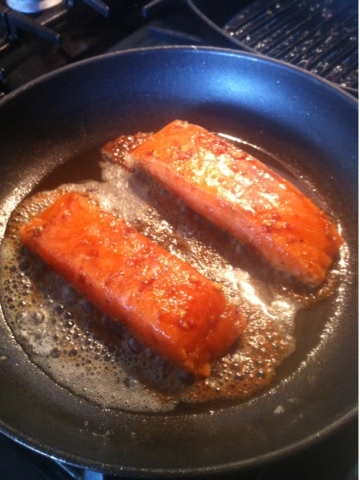 Carefully flip fillets and place skillet into preheated broiler on low for an additional 3 minutes. In the meantime take reserved marinade and place into new non-stick skillet. 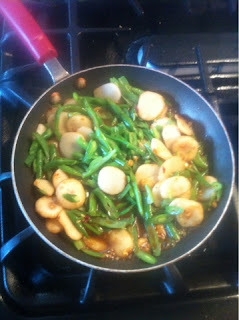 Heat well then add green beans and water chestnuts. Bring to boil and reduce sauce by half. Turn heat off and stir in chopped green onion. I topped the stir-fry with french's fried onion crispies, and then served saffron rice on the side.